I have been working for Trimcraft for 3 years and 5 months. Hopefully many more years to come! I am a Senior Designer. There are many aspects to my role, from supervising our Junior Designers, reviewing artwork and working on new exciting brands/products! One of many branding designs Adam has worked on. Aside from the copious amounts of black coffee, my average day is never really average. I could spend the day designing anything from ditsy florals to geometric patterns or developing a new set of dies. There is so much variation day by day. Definitely the team that I work with, we all get along so well! Mainly that we all bring something different to the team. Everybody has varying ideas and opinions which can help develop and bring the best out of each other’s work. I would have to say the Simply Creative pads or anything Simply Creative as I love simple vector illustration so this is right up my street. 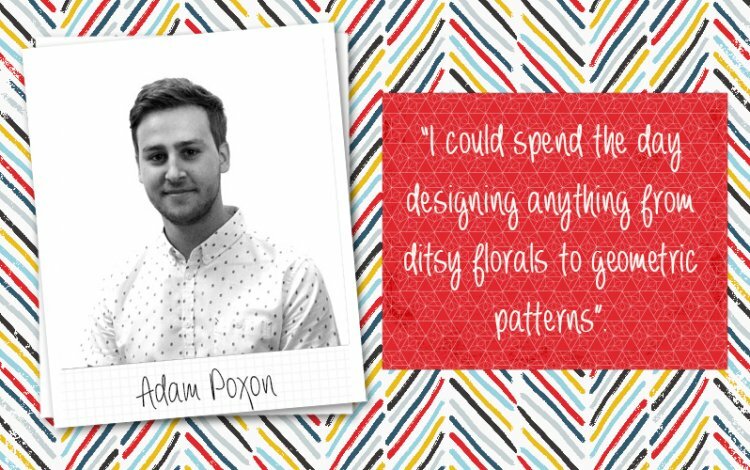 Adam’s trendy paper designs within the Simply Creative Mankind pad. Apart from spending most of my free time in the gym, I love to get out into the countryside and explore. I also love to cook so spend most of my weekend experimenting with new recipes. As well as spending my working day designing, I also like to keep up to date with what is going on in other areas of the design world too. I don’t particularly craft, but I do enjoy making prints for around the house and work on personal print and illustration projects. Aside from going on as many holidays as possible, I would probably set up my own print studio as I love anything hand printed. I am one belt away from my 1st dan in Karate, although I did finish training for this when I was 12. I would love to carry it on and hit that milestone. I also took part in a lot of sparring competitions across the UK and tried out a few other forms of martial arts. Adam’s adorable cat Alfie, awh!